hyperhtml Update 2/3/2018: Please note that hyperhtml was incorrectly categorized as non-keyed in the results of round 7. The version 2.4 of hyperhtml performs much faster than 1.12.5 as can be seen from the snapshot of the table for the next round. Results of 1.12.5 have been removed from the table. Further the were new major releases for react and angular. All in all there are currently 76 framework variants in this round. A big thanks to all contributors to this round! WebAssembly gives us the promise to run high performance code in the browser in a standardized way. 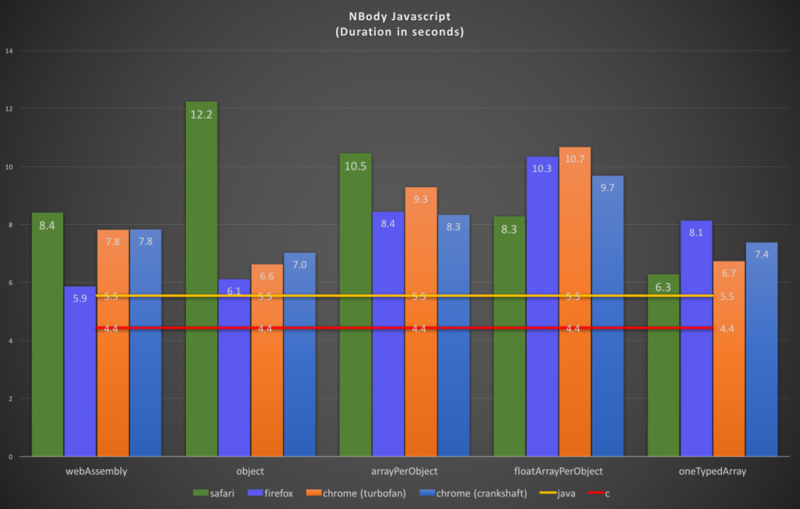 Now that there are a few WebAssembly previews available I decided it’s time to take a look at their performance. One source for benchmarks is the well known Computer Language Benchmarks Game and I decided to pick nbody (it’s almost four years ago since I did so last time…). oneTypedArray: All body’s data is stored in a single typed array and the advance function is programmatically unrolled (quite crazy, isn’t it). To get a baseline the fastest java and the original c version were added. All tests were performed on a 2015 MacBook Pro, 2.5 GHz Intel Core i7, 16 GB 1600 MHz DDR3. For all tests the best of three runs was selected for the result. Welcome to another round of the js web framework benchmark. Elm, Knockout, Nx, Binding.scala, Dio, Polymer, Simulacra and Svelete are new in this round. There are now two result tables: One for “keyed” implementations and one for “non-keyed”. I’ve written a separate blog post about that. The classification as keyed or non-keyed is not complete yet and only based on the current benchmark implementation and does not indicate that the framework doesn’t support the other mode. Feel free to send me pull requests! The “clear rows a 2nd time” benchmark has been removed. It showed a (maybe theoretical) issue in react that is fixed by now. I’d really like to thank all contributors (at the time of writing there are 33 of them). Without you it would be impossible to make such a comparison. 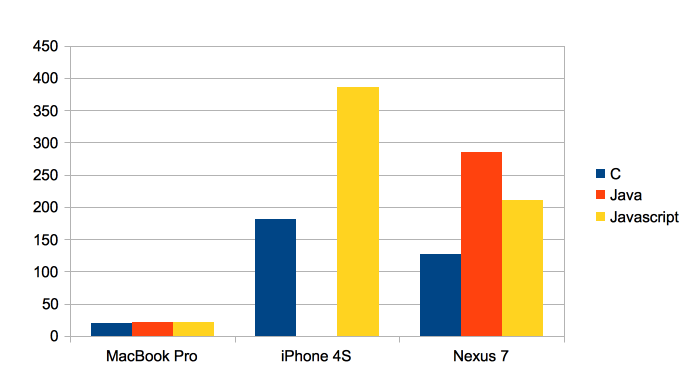 It’s still the case that frameworks are getting faster. Riot 3 is a big step in terms of performance in this benchmark. Ember is included again in this round and 2.10-beta is a big improvement. Apart from that many frameworks are in a performance range that should be fine for many requirements. Vue.js, kivi, vidom, plastiq, domvm and bobril in the keyed table show little weakness. As for the non-keyed frameworks the results are much closer. 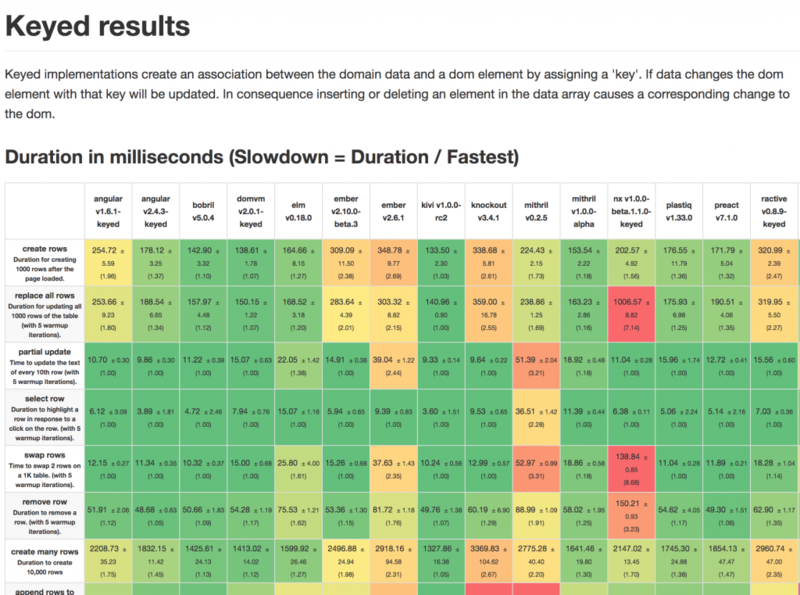 Dio, inferno and svelte are incredibly fast, domvm and Vue.js are only a bit behind. You can to click through the implementations in your browser here. Please keep in mind that all durations printed on the browser console are just approximations, but good enough to feel the effect between fast and slow implementations. The real results are gathered from the chrome timeline with the test driver in webdriver-ts. The next round of the js-framework-benchmarks will make a distinction between “keyed” and “non-keyed” implementations. This blog post explains what it means and why this distinction is relevant. One approach to measure the performance would be to use browser tools like the chrome timeline, which reveals exact timings, but has the disadvantage of being a manual and time consuming process and yielding only a single sample. At first I tried automated benchmarking tools such as Benchpress or protractor-perf, but I didn’t really understand the results and thus decided to roll my own selenium webdriver benchmark. I wrote an additional blog entry to describe this approach. To put it short it measures the duration from the start of a dom click event to the end of the repainting of the dom by parsing the performance log. To reduce sampling artifacts it takes the average of runnig each benchmark 12 times ignoring the two worst results.